I've been using this lately and it has proven to be very useful. Here is a very simple and effective way for debugging RxJs 5 code in Angular applications, or in any RxJs application in general. Probably in the future there will be more advanced tools to debug RxJs. But if you are starting an Angular project now and would like a way to debug what is going on and keep a good understanding of the code, this would help. This can be used in production without any problem. Its a great defense against memory leaks and other problems that might tend to creep in, as we will see in a second. Notice that if we want to add something else to the value we can define a function using the arrow operator, but otherwise if we simply pass the console.log function to the do operator, the values of the observable chain will be logged. The problem is that there is no way to turn off logging in production. We might want to have the logging on all the time, but it might be too detailed. It would be great to have this information only during development, here is what it would look like. This is what we are looking for: only one line in the console, with a initial message that explains what is going on followed by the data emitted by the observable (in the same line). 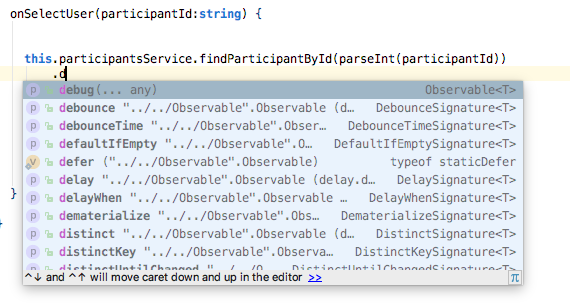 But debug is not part of the Observable API, so how do we implement that ? So what is going on here ? We are getting a reference to the prototype of Observable and adding it a new method. This means all observables in our application will be able to call this method. Then we are using the do operator to log to the console the result of new stream values, errors and completion. And its all only logged if the flag debuggerOn is set to true. We could take this further and add more functionality to it, make it more configurable. But this simple debugging utility would already help in a lot of situations. One thing to bear in mind is to avoid calling other observable operators from inside this utility operator. We could start turning cold observables into hot and trigger all sorts of unexpected behaviors. But this is Typescript, and debug is not part of the RxJs type definitions. So does this mean that we will get a compilation error? As our program gets more complex, it might be hard to reason about the multiple observable chains of the application without any logging. Its a good idea to add debug logging from the beginning, and constantly monitor the console output during development. All these situations can be detected early and fixed simply by keeping an eye on the log during development, and constantly validating our current understanding of how our program really works. Please let me know in the comments below, what other methods do you usually use to debug RxJs code? I hope you enjoyed the post, I invite you to have a look at the list below for other similar posts and resources on Angular.